A Interim Group Management Report 5 Executive Summary 12 Property-Casualty Insurance Operations 22 Life/Health Insurance Operations 28 Asset Management 32 Corporate and Other 35 Outlook 37 Balance Sheet Review 44 Reconciliations Interim Report Third Quarter and First Nine Months of 2014 Allianz Group 39 Our covered bond portfolio increased by € 5.8 bn to € 108.3 bn and accounted for 20 % of our fixed income portfolio – one percentage point lower than year-end 2013. 44 % (31 December 2013: 47 %) of this portfolio was German Pfandbriefe, backed by either public sector loans or mortgage loans. Another 16 % and 10 % of the covered bonds were attributable to France and Spain, respectively. Covered bonds provide a cushion against real estate price deterio­ration and pay- ment defaults through minimum required security buffers and over- collateralization. Our corporate bonds grew by € 22.4 bn to € 138.7 bn – representing an increase from 24 % as of 31 December 2013 to 26 % of our fixed income portfolio at the end of the third quarter. This increase was driven by new investments and to a lesser extent lower interest rates leading to fair value increases. Our exposure to bank securities remained almost unchanged at € 33.3 bn (31 December 2013: € 33.1 bn). Given the growth in our total fixed income portfolio, the portfolio share of this exposure decreased by one percentage point to 6 %. Thereof, the exposure to subordinated securities in banks slightly increased from € 4.8 bn as of year-end to € 5.3 bn. Ourexposuretoasset-backedsecurities(ABS)wentupby€ 3.6 bn to € 22.0 bn and still accounted for 4 % of our fixed income portfolio. Theincreasewaslargelyrelatedtonewinvestments.About72 %ofour ABS portfolio was related to mortgage-backed securities (MBS). MBS issued by U.S. agencies, which are backed by the U.S. government, increased by one percentage point and accounted for 15 % of the ABS portfolio. Overall, 98 % of the ABS portfolio received an investment grade rating, with 87 % rated “AA” or better. Investment result investment income (Net) € mn three months ended 30 September nine months ended 30 September 2014 2013 2014 2013 Interest and similar income (net)1 5,196 5,036 15,673 15,403 Income from financial assets and liabilities carried at fair value through income (net) (231) (563) (604) (1,489) Realized gains/losses (net) 893 690 2,825 3,028 Impairments of investments (net) (156) (162) (592) (478) Investment expenses (261) (227) (693) (653) Investment income (net) 5,440 4,774 16,610 15,812 1 Net of interest expenses (excluding interest expenses from external debt). 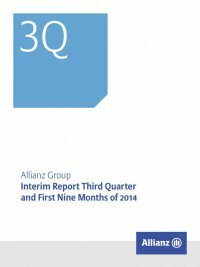 2014 to 2013 third quarter comparison Our investment income (net) increased by € 665 mn – or 13.9 % – to € 5,440 mn. This advance resulted primarily from an improvement of our income from financial assets and liabilities carried at fair value through income (net) but also from an increase in realized gains and losses (net). Income from financial assets and liabilities carried at fair value through income (net) improved by € 331 mn to a loss of € 231 mn. In the previous year’s quarter, the result was considerably impacted by losses from the net of foreign currency translation effects and finan- cial derivatives, mainly within our German Life/Health business. Derivatives are used to protect against equity and foreign currency fluctuations as well as to manage duration and other interest rate- related exposures. The recovery compared to the previous year’s quarter was mainly due to an improved foreign currency result main- ly driven by a burdened third quarter of 2013 due to the depreciation of selected emerging markets currencies. Realized gains and losses (net) were up by € 203 mn to € 893 mn. This was primarily because of higher realizations on debt instru- ments, and to a lesser extent equities. Our interest and similar income (net)1 increased by € 160 mn to € 5,196 mn. This was mainly due to higher interest income as a result of a higher asset base. Impairments (net) were largely unchanged at € 156 mn (3Q 2013: € 162 mn). Investment expenses increased by € 34 mn to € 261 mn. This was mainly due to asset management fees. 2014 to 2013 first nine months comparison Our investment income (net) increased by € 798 mn to € 16,610 mn largely as a result of the recovery of our income from financial assets and liabilities carried at fair value through income (net). 1 Net of interest expenses (excluding interest expenses from external debt).